With the recent economic downturn many nonprofits are facing hardships, but few have over 400 wild & exotic animals that need specialized care the way Wildlife Animal Orphanage does. Many of the animals at Wildlife Animal Orphanage come to this sanctuary as their last chance for a happy life. The organization has been in operation for 24 years and their dedication to the animals has been proven time and time again. Even when the chips were down, they continue to rise to the occasion to help whenever possible. "The folks at Wildlife Animal Orphanage were a tremendous help to our rescue efforts following Hurricane Katrina. I have been out to their sanctuary in San Antonio several times and it is a beautiful place where so many animals have sought refuge," shared Patty Hegwood, Animal Care Director of Best Friends Animal Society, a testament to the organization"s willingness to jump in and help animals in need, whenever possible. 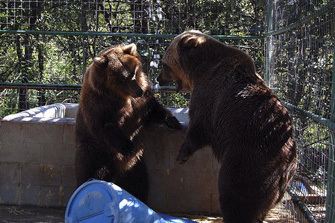 Animals like Tiny and Tasha, (pictured left) American grizzly bears that came in with 3 tigers, a lion, and a baboon now call Wildlife Animal Orphanage their home. They were living in a garage in Michigan in cages too small to get up and turn around in. As a result, Tiny, the male, is missing the hair on his bottom from being stuck sitting in his waste for long periods of time. Places as caring and compassionate as Wildlife Animal Orphanage are too few and far between - Tiny and Tasha are among the luckiest exotic animals in this country - what Wildlife Animal Orphanage provides is extremely unique. Or take Ekaterina (lead image) - she came to Wildlife Animal Orphanage from Ohio, rescued by International Fund for Animal Welfare and Big Cat Rescue. A lady had 5 cats total on display for a fee for people to go take pictures sitting with the tigers. A girl went in to take a yearbook photo and was killed, the authorities were not sure by which tiger. A tragedy all too common in this day and age, but where are these animals, that are not artifacts to be displayed, to go? Without Wildlife Animal Orphanage, their futures are precarious at best. Many big cats can wind up in canned hunts or go to "tiger farms" where their parts are worth more than their cost for care. In addition to disregarded "animal attractions" like Ekaterina and Tiny and Tasha, Wildlife Animal Orphanage is also home to many rescued research animals like Sparta. 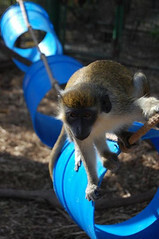 Sparta, (pictured left) a vervet native to Africa, was used in behavioral research at a nearby university. Again, with the help of Wildlife Animal Orphanage, Sparta is able to feel safe, secure and content for his remaining years. It"s support from people like you that make a place like Wildlife Animal Orphanage a reality! With a desperate need for funds to help them get through this difficult time, it"s our turn to step up to the plate and do all we can to help this special organization make it! There"s over 400 reasons to support them now. Click here for a beautiful slideshow of some of the animals that thrive because of WAO! 1. Stores and individuals in the San Antonio area to donate fresh fruits, vegetables, red meat, chicken, bear food, dog food, and domestic cat food (45 domestic cats are at the WAO). In addition, cleaning supplies such as trash bags are needed. 2. Monetary contributions to the WAO to pay for food, ongoing veterinary care, care-giver employee salaries, electricity, and other necessities to give proper care to the animals. Rest assured that ALL contributions will go toward direct animal care; donations are carefully monitored and secured. Contributions may be made on-line at the WAO website: Click here! 3. If you would like to help the WAO get through this extremely difficult crisis situation and to save the precious animals whose home is now in jeopardy, PLEASE HELP!